I have officially ended my relationship with boxed cereal. For years, I’ve been underwhelmed with the cereal options on the store shelves. Then I discovered the joy of granola. But alas, even the best store-bought granola had its shortcomings – it was pricey, not very fresh, and contained lots of preservatives. Thus began my personal quest to make homemade granola. After looking at several different recipes, I realized that there are endless ways to customize granola, according to personal taste. 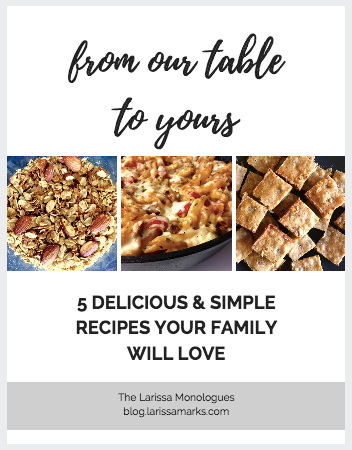 I tried multiple variations, which were all tested by my husband, a granola junkie. After a few rounds of tinkering, I believe that I finally created a recipe worth keeping. This granola recipe is a truly amazing blend of sweet, salty, and crunchy. It is packed with good things like protein, fiber, vitamin E and folate. And it makes the house smell wonderful, and has made breakfast in our house a delight. It perfectly captures the essence of “homemade” at its best. Preheat oven to 275. Line a rimmed baking sheet with aluminum foil. In a large bowl, combine all ingredients except the dried fruit. Stir well to incorporate. Spread the mixture on the prepared baking sheet in an even layer. Bake for 30 minutes. Stir in dried fruit, and bake for 15 minutes more. Remove from oven, and cool completely in pan. Once the granola is cool, store in an airtight container. Whoa! This looks delicious! I would need to cut out the oats and wheat germ, but I think I could still swing it. I definitely want to make some now! Dear food allergies, I hate you. Take 2….I just wrote a comment but got an error.What I was saying was: You make healthy food look scrumptious!I wish I could move on from Captain Crunch Berries to adult cereals….but my taste buds will not let me.I need a “how-to” book to learn to eat like a healthy adult. I was just thinking about how much packaging boxed cereal comes with and how it probably isn’t so hard to make your own. I thought this out loud this morning–we are in sync as always, sister. Anyway, I like your recipe because it is oat-based. My old stand by is shredded wheat and I am trying to eat less gluten, so granola would be an awesome alternative.I’m going to try to blog more frequently. I just need to replace my broken digital camera! ohmygosh this looks divine. however i don’t think i could part with wheat chex, i love them too much. Beautiful looking granola! I love the idea of putting in stuff you like instead of buying premade. I’m definitely going to try out this recipe. Sounds like a yummy and healthy idea! Are you also going to post some red-meat substitute recipes? I’m very anxious to try tofu or some other protein to try and eat less read meat myself. this looks great. a perfect recipe to make this weekend. You always post the most delicious looking recipes! I’m for sure going to have to try this one out! Larissa- I found you on stumbleupon! The granola looks great. I am trying to be healthy too but just can’t say goodbye to steak just yet! A little at a time! This looks delicious! It looks like the new granola bars Starb*cks has that are so very yummy. Definitely trying this! that looks so healthy! Good on you! 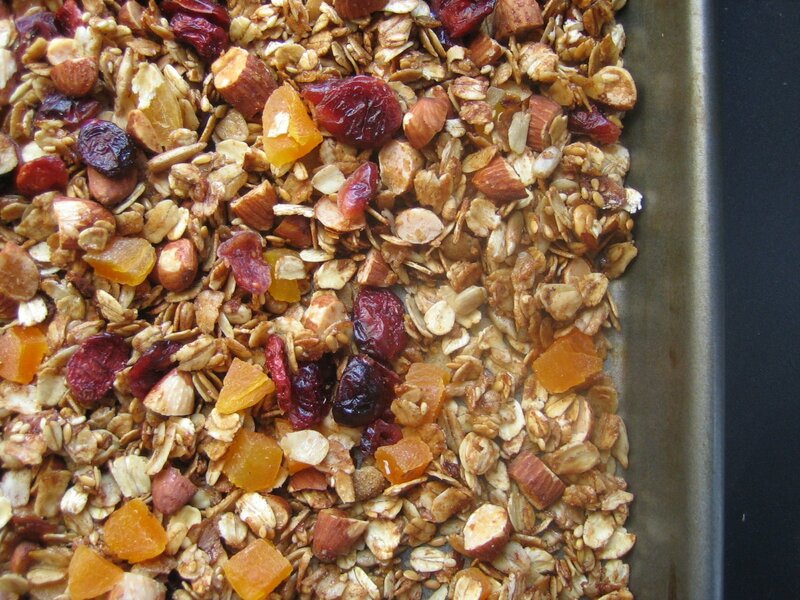 i love granola and really want to try making my own. there are so many recipes out there but i think i might have to try this one first 🙂 looks great! It looks great but dried fruit is extremely high in sugar and calories…could you give a nutritional analysis of the recipe…I’d be most interested in the calorie and sugar content per serving…thanks. Anonymous – I don’t have the nutritional analysis, but would welcome it if someone wants to do the math! Also, I use dried fruit with no sugar added. All fruit has natural sugars, but are also high in fiber and potassium. But for those who prefer not to have dried fruit, that can easily be omitted! Okay, I did the nutritional analysis of this granola which I made today. I made the recipe as directed, but used banana chips for dried fruit because the dried fruit I could find had lots of sugar & the banana chips didn't- BIG MISTAKE. I had no idea how much FAT (saturated! )is in the banana chips! So, keep that in mind with the numbers. The cranberries also have added sugar, but I had them on hand. So, if you use no-sugar-added fruit (which I recommend) and stay away from the banana chips- it will make a difference in sat fat/cal/carbs.1/2 cup serving is as follows:CALORIES: 238gFAT: 16g (3.6g sat, 1.7g poly, 2g mono)*3 g saturated fat from banana chipsSODIUM: 58mgCARB: 29gSUGAR: 12.5g *2g from cranberriesPROTEIN: 5.3gFIBER: 4.5gThe cereal is quite good! I plan to do a cost analysis next. Thanks! Anonymous – thanks for the analysis…that’s great to have, since I make it so frequently! I’ve been using raisins (and sometimes sugarless cranberries) for the fruit. It looking really very amazing!!!! !